Early Thursday morning March 21 Ludlow lost a really good man. 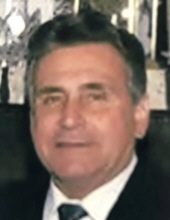 David A. DesRosiers, 75, passed away peacefully at home, surrounded by his loving family. Born in Ludlow, son of the late Arthur and Viola (Minnie) DesRosiers, he was a US Army Veteran proudly serving during the Vietnam War. Dave was the longtime owner of D. A. DesRosiers Auto Body, and most recently he retired from his work with the Diocese of Springfield. He was a faithful communicant of Sacred Heart Church in Springfield. Dave was a man of many interests. A fervent Patriots fan, he also enjoyed golfing at many area golf courses. He loved reading, especially histories, and watching movies. His DVD collection is the envy of many movie fans. From an early age he loved muscle cars, especially his first new car, a Ford Galaxy, and always took pride in keeping his cars sparkling clean. With his wife Joyce he loved vacationing in Boothbay Harbor, Maine where he enjoyed his specially-made martini while watching the boats on the water. But most important of all, he loved his family. He was the loving husband of Joyce A. (McClelland) with whom he shared a blessed longtime partnership in his marriage of almost 49 Years; a devoted and loving father to Deena DesRosiers; a dear brother to Jeanne DesRosiers and the late Philip DesRosiers and his widow Marcia; uncle of Michael DesRosiers, his wife Dawn, and their son Jake, and Michelle (DesRosiers) Bageris and her husband Alex, and the late Marc DesRosiers; and he also leaves many loving extended family members and dear neighbors and friends. Dave believed in the idea that "it is what it is" and it made him a realist in all matters of life and death. This really good man will truly be missed by all. Funeral services for Dave are on Wednesday, April 3rd. Friends and family are asked to gather for a Liturgy of Christian Burial at 12:00 pm in Sacred Heart Church followed by burial with Military Honors at 1:00 pm in Massachusetts Veterans Memorial Cemetery in Agawam. David’s family will begin greeting people at the church at 11:00am. Ludlow Funeral Home has been entrusted with the arrangements. David's family has requested that no flowers or gift be sent and In lieu of, donations made be made in Dave's memory to Sacred Heart Church Renovation Fund 395 Chestnut Street, Springfield, MA 01104. To send flowers or a remembrance gift to the family of David A. DesRosiers, please visit our Tribute Store. "Email Address" would like to share the life celebration of David A. DesRosiers. Click on the "link" to go to share a favorite memory or leave a condolence message for the family.